October 1, 2010 marks the first pay which my employer starts my pension. It's a defined contribution pension plan which means that the contributions are set in stone, not the benefit. The benefit (after I retired) will be based on how well the money does with the investment profile I've selected. My employer matches 5% of my gross pay, so a total of 10% - I'm pretty pleased that I'm finally putting 10% away (even if 5% of it is from my employer). Two years after the plan starts, it will be vested - which means no matter what happens with my employment, I have 100% rights to my company's contriubtions on my behalf. If I leave any sooner (for whatever reason) - my company will keep it's share. While all of this is fantasitc - it puts a bit of a hitch in my pay, and the budget that I posted yesterday. My take home pay is going from about $1450/bi-weekly to $1320/bi-weekly - a take home reduction of $260/month. 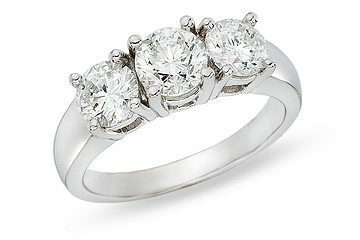 Now, don't get me wrong, I've been wanting this for a long time, it just means some re-planning. As you can see at the bottom, we're going to be down about $220. We already wrote our mechanic the cheque, and I defn. want to pay our credit card bill off in full. We do have about that mutch in the wedding fund - and as the c/c bill is mostly my ring anyways - I'm thinking I may pull money from there to cover the overage. I know that we could fiddle with some of the planned spending/savings - but everything is automated, so it would be a big pain to have to stop all payments and then restart them again. As we're just a couple of days away, I thought I would put up our budget for October. This month has five pay days, which is why the income section is higher than normal. The cell phone bills and enmax are guesses based on previous use - and I update these as the bills come in throughout the month. whoo hoo! My insurance went down by about $30/month! Jordan and I changed our allowances to be $25/week instead of $100/week. Which means that our planned spending (aka, planned master card bill) will be a bit higher. As you can see above, I'm going to start out budgeting for $1,500. Yup....it's a big mastercard bill. But we can pay it off, in full! We had some work done to my car over the past couple of weeks. This amount pays that bill. It has been so so busy lately! With checking out vendors and spending more time visiting family in the last few weeks then we have in a long time - I haven't had much 'veg' time (or blog time). So, this is a bit of a catch up post. Jordan and I have paid a $500 deposit to secure or vendor and picked up a few things (benches, arbor) to help set the stage on the big day. I love, love, love my ring! I still can't believe how much we spent on it! I probably haven't told you the cost yet, but it will be showing up on this months spending summary in a week or so. We're going to go to BC this coming weekend to see the venue and meet with a couple of photographers. I'm hoping to also squeeze in seeing a DJ. So my car has needed more and more repairs. I told you about the hit & run that I got into - so there were some repairs there. My gear shift was acting funny and my e-break wasn't working - so that had to get fixed to. Plus my blower for hot air finally got fixed (let me tell you, Alberta winters have been really cold on my feet). I don't have the final bill yet, but e-mailed my mechanic asking if we can get that sorted out sooner rather than later. I have loved visiting family all over the place! Naturally, our gas bill is going up some - but that's just fine because we get to visit to many people. We went to the Vancouver, BC area last weekend to visit some of Jordan's family which was nice. We were able to use our air miles so a nearly $900 flight cost only $350 plus $100 of random expenses. So - was it money we had? Not necessarily, but the trip was priceless. We hadn't visited this part of Jordan's family for probably a year or more - so it was time. I've applied for some funding to get my CHRP this year, I'm really hoping it goes through! The first exam will cost $262.50 plus $367.50 for a study workshop and falls in May, 2011. The second exam costs $525.00 and the working shop is another $367.50. Before I could even consider registering for these exams I had to become a HRIA member (Human Resources Institute of Alberta). The registration fees cost $137.81 for the remainder of the year - I'll have to pay the whole fee come January, 2011. The first exam is The National Knowledge Exam ® (NKE) which consists of 150 multiple choice questions. Each question lists four possible answers, only one of which is correct. The exam is based on academic knowledge of major human resources functions. The passing grade is 70%. The second exam is The National Professional Practice Assessment ® (NPPA) assesses one’s understanding of the RPCs (registered professional capabilities) as they relate to experiential knowledge. Experiential knowledge is implicit and much more difficult to quantify or describe effectively. It refers to the wisdom gained from experience and insight in applying academic knowledge to actual or simulated situations. So there's everything in a nutshell, I hope you've been having a good week! I was talking to my mom last night about our wedding budget, and realized that there are still several items that we forgot to include. Part of this realization comes from an amazing gift from my grandmother. She wants to take care of a weeks worth of accomodation following the wedding for our Honey Moon. Back up, a honey moon? That's not on the budget. ahh well, it's a learning experience that's for sure! We'll get it organised before too long. I would like to tell you that the title of today's post is some sort of clever way of describing exactly what it's not. However; that's not the case. A week ago Monday, I was driving to work and a transport truck changed two lanes and moved directly into me! I saw him coming and was able to brake (thankfully no one was behind me), but he still hit my driver's side mirror. He managed not to take it right off, but it bent backwards. Considering what happened, I came out fairly unscathed. I caught the license plate number as well as the 1-800-how's my driver number. Armed with those, I called and reported the hit and run to the local police. The guy who owns the fleet is happy to pay for the costs to repair this - thankfully, we won't have to go through insurance. It costs more and takes longer. I got a quote done by my mechanic yesterday, and it's going to cost just under $500 for the part and the labour to get the job done. While we have enough in our emergency fund to cover this, I'm so glad we don't have to use it! We had a great last weekend of summer! Did you? Friday was pretty low key, but Saturday we hosted a 'last hurrah' BBQ. Lots of Hotdogs, Burgers & Beer! We went from 2pm until about 2am. I love casual nights like those. They are inexpensive, when compared to a night out on the town - plus, it's a great way to catch up with friends. On Sunday, my parents came into the city for a drive so we got to vist with them for a few hours. We talked about a whole pile of things (wedding talk) and I was able to share some apple crisp I had made that morning. This year, the apples are bigger than they have been in previous years too - which is a nice treat! CPP & EI - Do you max out? Last year, in December, I was pleasantly surprised on my last pay of the year with a bit of an increase. It wasn't much, but it had me interested enough to look into it a little deeper. As it turns out, I had maxed out my CPP contributions for the year. As I got a raise this past April, I thought that I would hit the maximums sooner rather then later...so I did a few calculations. Before I get into them, perhaps I should give a bit of background on CPP & EI and what the maximums mean for those folks who have no clue what I'm talking about. The Government of Canada established the CPP program in 1966. It is an earnings related social insurance program that provides basic benefits when a contributor to the plan retires or becomes disabled. When contributors die, the Plan provides benefits to their survivors. The benefit is meant to supplement an individuals personal savings, investments and retirement portfolio. The employer is required to contribute the same amount of CPP that is deducted from an employees pay to a maximum amount every year. A CPP retirement pension is a monthly benefit paid to people who have contributed to the Canada Pension Plan. The pension is designed to replace about 25% of a person's earnings from employment. Every employer is required to deduct CPP contributions from an employee's pay if that employee meets certain requirements (age, is in pensionable employment, is not currently receiving CPP benefit through retirement) to the annual maximum, which can change from year to year. Employment Insurance provides temporary financial assistance for unemployed Canadians while they look for work or upgrade their skills.Typically, you will not be approved to receive an EI benefit if you quit or are fired your job with cause. If you are laid off, this benefit is available for you to apply for. Canadians who are sick, pregnant or caring for a newborn or adopted child, as well as those who must care for a family member who is seriously ill with a significant risk of death, may also be assisted by Employment Insurance. Every employer is required to deduct EI premiums from their employees insurable earnings on every dollar up to the yearly maximum. All employers must also contribute 1.4 times the EI premium withheld for each employee. I will max out my EI contributions on my second October pay. I will max out my CPP contributions on my first November pay! So, what does that mean? It means that I'll net an additional $380.22 by Christmas. Combine that with savings from my recent insurance premium deduction, and we're not looking to shabby! Thank you so so much for all of your comments yesterday. There were so many thoughtful ones, that I thought it deserved writing another post about it to comment back. @ every little kiss - What a great idea to have buffer money! Do people actually say they are not coming and then come anyways? or RSVP with more guests then you actually invited? @ SSBC - Thank you for the congrats! Life has a way of getting away from us! @ Shenanigans - I had a look at margotthortnphotgraphy.com and it looks like her website is back up! Thanking you for sharing that link, at your personal album with me. She is really quite good (and I love the cupcakes, I think Jordan and I are going to do something like that too). I would love the info on the wedding DJ. It looks like the one we're looking at from my home town my fall through due to prior obligations. Does this DJ travel? We're lucky that we have both a wedding commissioner and a pastor in our family - and as we'll be getting married in BC, it will cost under $100 for the service itself. I have to remember to also buy a license! @ Shenanigans (again) - oh right... gifts! I keep forgetting about that. Jordan and I each have two attendents (I think that's what they're called) and we're not planning on a ring barer or a flower girl...so we need four awesome gifts. We'll defn. have to pad the budget a bit here. @ every little kiss (again) - ahhh yes....invitations. If we actually want people to come to this shindig, we might have to find a way to tell them about it. We were thinking about having a wedding website for RSVP's, travel information and the like - my mom figures that will work for 80% of our invites...but perhaps not the older generation. We may be able to save some on postage doing that....I'm hoping. We went to Michaels and looked at pricing on paper...hopefully we can get the job done for under a couple hundred bucks. @ mom - any help we get from family will be absolutly amazing...but we will do our best to plan and pay for everything ourselves. @ canadiansavings - my grandma, who has made several wedding dresses and is an ammmazing quilter has offered to make my wedding dress. We will only need to buy material and rent Jordan's tux. It may be a pretty weak number - to be honnest, we havin't looked at the priceing of things at all yet for clothing. @ payingmyself - Hurray! I'm glad I could do that. I'm happy to share this budget, and any others as our lives grow and change together. I'm really not sure what a more realistic budget would be for clothing...even with my grandma's help. @ all - Thank you again to everyone who gave us such awesome feedback!! Their will defn. be a few more line items appearing in our final budget! It's strange, I always thought people who spend upwards of $10,000 and multiples of that were crazy! How is it possible that weddings actually cost that much!? Well, apparently weddings do cost that much! 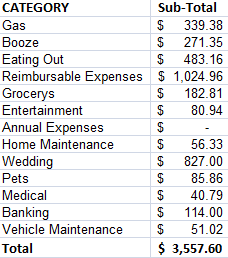 Below is the first 'draft' of our wedding Budget, next to each line item is how much we have spent already. At first I thought we would have a year to save for everything - and that is plenty of time - but people actually want deposits to confirm bookings (imagine that!....silly me). So, we will have to spend some of our normal planned spending money on deposits and what not, which is fine. Because of this we won't have to have as much cash on hand come the new year. We have booked our facility and put a $500 deposit on it. The food costs are based on the caterer's standard menu, however we have not confirmed our meals yet. We plan on having champagne and wine with a sit down supper, but there will be a two-nee bar to help manage costs. I have still budgeted $250 here for non-alcoholic drinks and the permit. The photographer we like, may cost more than this - but we shall see. We'll be meeting her next month. The rest is allll guesses and 'hopes'. It would be stellar if we could keep this under $10,000 but that might be wishful thinking. You may have noticed that my engagement ring and our wedding bands are missing from this budget. The budget is for the actual ceremony/reception - we'll be taking care of the rings separately. When I got home from work last night, I was pleasantly surprised to receive a notification from my Automobile Insurance Provider, AMA. My policy renews in October and my premiums are reducing. I'm going from $1803.36 annually to $1477 annually - a decrease of $326.36! As a result, I 'punished' myself by buying this vehicle instead of something nicer/newer. I figured I shouldn't drive anything else if I couldn't not break it. So far, it's worked. I have the least amount of covereage I've ever had (just what I'm required by law to have), and my car is in the best shape! That's another $325 into the wedding fund! On the tail end of our engagement and the prospects of buying a house within the same time frame of less than a year. Jordan and I have decided to make a change to our allowance. Part of this decision came from the realization that it's a pain in the but to have our allowances and still have to budget for our phone bills, hair care, clothes ect. We both want a truly 'splurge' account rather than what we're doing now. So, over the next week or so we'll be calling our cell phone providers to have them bill our joint account. Our new allowance will be $25/week instead of $100/week. We'll now have to have to have a few more conversations around clothes, personal care products and pretty much everything else that will be considered 'joint'. I'm looking forward to this change, I think it will help keep us on track and save our our house/wedding even faster. Expectations - Who Pays for What? I'm not sure if I mentioned this or not yet: Jordan and I are planning to pay 100% of our wedding costs. While I've never thought it would be any other way, I appreciated when my mom made sure Jordan and I knew right away that she and dad haven't been squirreling away their pennies to pay for our big day. When my mom did tell me, I was initially surprised - telling her that of course Jordan and I expected to foot the bill. My mom went on to say that my grandma had paid for her and her sister's weddings - and so she just wanted to make sure I knew. Last weekend when I met up with my grandma and one of my aunts, on two separate occasions to chat wedding bells - $$ came up, and they both insisted that they were 'sure' mom and dad would help us out. I told them that no, Jordan and I would be covering it and were happy to do so. I thought it was interesting that mom wanted to make sure that Jordan and I knew - when now it looks like it's actually other parts/members of the family that may have those expectations around who pays for what. That scenario got me thinking - do other people have expectations that my family or Jordan's family will pay for different things. What about our bridesmaids/groomsman - will they expect that we pay for their outfits? I haven't been to many weddings...the last was probably when I was just 8 or 9, so I'm not really entrenched in the wedding culture of who pays for what. My best friend Amy bought me a huge wedding planning book, which is stellar! It has goes into crazy detail about those 'expectations'... which of course are just the traditional ways things are done....but we are far from that sort of traditional families. So, I ask you (and not just with a wedding reference) - have you ever been in a situation where you expected someone to pay for something, or they expected you to and it was awkward? I'm looking to build some tools or ways to manage those potential awkward conversations. When Jordan and I joined our finances (only a few months ago), I mentioned that my bi-weekly budgets would be dissapearing, but in their place would be end of the month spending re-caps. Today, I give you our first re-cap. The first one is a bit unique as we were feeling out how the joint credit card would work in managaing our finances. We had a vacation and family emergency in August, which is why our gas and eating out are so high and on that vacation we went to a winery. I couldn't decide if the winery was actually entertainment or booze, but I put it under booze. The Reimbursable Expenses include Jordan's texbooks, my contact lenses (and fitting fee), as well as some things we bought for my parents. I'm surprised that we only spent $200 on grocerys, but looking at that with the eating out makes more sense. All I'm going to say about the wedding expenses, is that was the down payment on my engagement ring. It's currently being made, and we should be able to pick it up (and pay for the rest of it) on Monday. We needed a new light for the tank and had to pick up some fish food. I am on the hunt for some excellent wedding/marriage blogs. I would love recommendations for Canadian blogs that have great diy prjoects and discuss budgeting (of course). The last week has gone by so quickly, I can't believe it's Labour Day already! I've spent just about every day since getting engaged last Saturday thinking and planning our wedding. Jordan started getting a little overwhelmed and asked if we could just enjoy being engaged! Well, of course we can (while I'm planning). I spent the weekend wedding planning with my mom, and Jordan was fairly involved too (when he wanted to be). We have a good sense about theme, colours, food, location ect. I'm not going to post anything for sure because we are still looking a bit. My best friend Amy and I are going to a bridal show next weekend to get inspired, so things may change, but I'm not thinking they will. My grandma has offered to make my wedding dress *eek* (I get a wedding dress). She made a couple of my aunts wedding dresses and a couple of family friends dresses too. I'm looking forward to getting a sense about what she can make and what I want and having that come together. When we announced our engagement on Wednesday, one of the comments was 'and another one bites the dust' - it is a bit funny that quite a few personal finance bloggers have recently gotten engaged/married. I won't make any promises about what I will or won't write about - but I do promise this, I'll keep writing. I haven't disappeared - just have been in meetings (will be) for two full days, plus work dinners and what not. Also, I'm freakin' exhausted. Actually, too tired to think about money, so I'll tell you about my crummy night. My roommate, for the fourth or fifth time woke the house up in the middle of the night. His weekends are Wednesday/Thursday - but he's just got to stop waking me up! I told his guests, one of which was a former roommate, to get the F* out of my house if they couldn't keep the nose to a dull roar. They all left, and then talked about me outside my bedroom window.... granted, our roommate tried to tell his guests that me and J are 'nice people' and Jordan was sick - they started getting noisy again. He finally got them away from the house and I went back downstairs to turn off the lights, where I ran into the roommate coming back in for something. We wound up having a "conversation" at 12:30am about respect. The conversation actually went pretty well, with good back and forth however; I ended it by telling him that he needed to make a choice. If he wants to live like a a responsible adult, with adults than we are happy for him to live with us. If he wants to live like an irresponsible person, then he needs to find like minded individuals to live with - because that isn't acceptable behavior in our house. He said that he wants to live with us, and I said great! Honestly, I'm happy for whatever choice you make, just let us know what you want either by your actions or by giving us notice, either way, just please - let me sleep. He then went in for a hug... which I gave him...which was sort of weird...but hopefully a good sign.